SpecVet is what is referred to as a Client-Server database system, whereby client workstations connect to the database server. That connection must be maintained active all the time to have SpecVet continue to operate propertly. If there are network interruptions, the workstation will be get disconnected from the server, and a dialog similiar to the one below will be presented to the user. You willl need to select "Close File(s)" if presented with this dialog. SpecVet is unable to make a "Reconnection"
Ensure that the computer's settings are setup so that it will not go to sleep or hibernate. 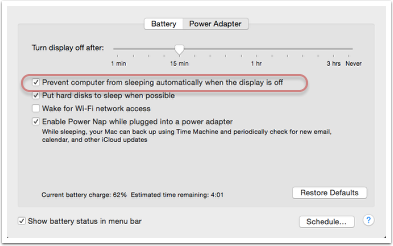 On Mac OS X, please review the Energy Settings within System Preferences and ensure that the checkbox for "Prevent computer from sleeping automatically..." is checked. There are some similiar settings for Windows computers, but vary based upon the version of Windows and hardware. Also, when using a laptop, typically closing the laptop will put the computer to sleep, and thus, disconnect itself from the network. Users should refrain from closing the laptop throughout their day. Typically laptops can lose their network connectivity when using Wireless (WiFi) networking due to #1 above; poor signal strength for the WiFi network; or moving between different WiFi networks when moving around different areas in the hospital. If this is a common problem, you will need to discuss this with your IT consultants, and ensure that all areas of utilizaing have good WiFi signal strength. Also ensure that the WiFi network in continous – not separate networks for different geographic areas within the clinic. If the disconnects tend to occur at remote sites, and not at the main hospital, there is probably an issue with the networking between the remote site and the main hospital. You will need to contact your IT consultant to have them troubleshoot the network, the Site-Site VPN, or the Internet at the various sites. 4. Issues with the LAN/network hardware. Rarely there may be problems with the IT infracture within the hospital involving network switches, routers, etc. You will need to contact your IT consultant to have them troubleshoot the network, and potentially reboot the network appliances. These are just the common issues that we have seen at SpecVet. These may not be all of the potential causes of network problems.